I saw this project plan in Wood magazine and instantly knew I had to build it. When making pocket holes in stock wider than a few inches, I’d have to try and hold it flat against the bottom of the Kreg jig while clamping it, and this project takes care of that problem with the support strips on top of the storage box. Inside the box there are little subdivided compartments for storing pocket screws, bits, and whatever else you might need to keep close at hand. Best thing about this project is that it took about two hours to build and only cost about $9 (I had plenty of plywood scrap, but had to buy the continuous hinge and clasp to keep the box closed). Now, I’m trying to think up another project that uses pocket screw joinery so I have a chance to use it! The only thing I’d do differently if I built another one would be to use a different type of hinge. The plans in the magazine call for a continuous hinge, but since the continuous hinge isn’t mortised, when the box is closed, there is about an 1/8” gap at the back due to the size of the hinge. It’s not big enough to cause things in the box to fall out of their compartments, but it visually detracts from the finished project. I’d either use regular hinges and mortise them or use non-mortise hinges. The plans also call for plywood as the support strips on top of the box, but I didn’t want to run plywood through my planer, so I used some scrap oak, which I think looks nicer anyway. I also used four workpiece supports instead of the two that were in the plans. This way, if I’m working with a smaller workpiece, there’s a better chance that it’ll reach the supports. That is great! I love the storage! Very cool idea and well executed. I just might hafta make me one-o-these. Nice job! Thanks for sharing. Thanks for sharing. I didn’t know it existed, but will surely get those plans. Kudos for sharing your construction notes and tips. They are extremely helpful. Most LJ’s don’t give more than a picture. You are a true and helpful LJ!! Great job. I have one of these jigs and that looks like a great way to use it and keep everything together. I do have one question after looking at it and using one of the Kreg jigs. Would you make the top lid longer than the base of the box so you can clamp the jig to the lid and the whole box can still all sit flat? I know you would loose the the latch or have to move it but just wondering? That way the jig doesn’t move when working with it. I love having my “special” jigs in their own homes; very effective and a job well done. I would recommend that you keep the drill bit away from any other items in the case, just to keep objects from rubbing on the sharpened edges. 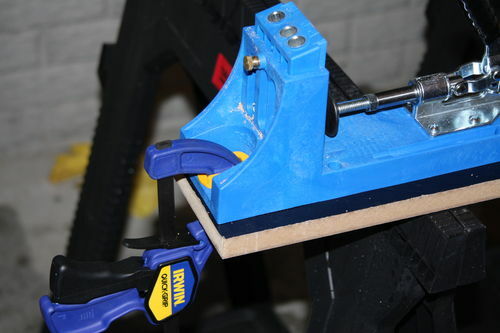 This would be very helpful when using my Kreg jig! Using 4-blocks instead of 2-blocks makes more sense to me. Hope you find lots of useful ways to use your new workcenter! JHawkFan, not sure what you mean, but the base is longer than the box so you can clamp it to the bench and also hang it on the wall. The jig itself is screwed to the lid so it doesn’t move around. I also forgot to mention that the original plans call for the box to be 10” deep, but the jig is longer than that so I made it 11” deep. 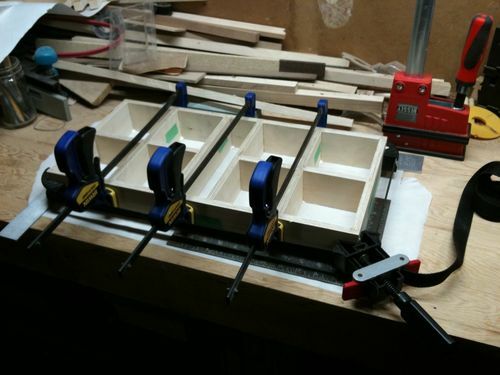 Here’s a picture what I meant about clamping the jig to the lid. To do this you would have to make the lid longer on top. But if you have it screwed down then problem solved. I didn’t realize you screwed the jig to lid. Vonhagen, I agree…the original case is about useless. I thought about tossing it but figured I’d keep it around in case I ever decided to sell the jig, although I dont ever see that happening. That’s a neat looking workcenter. You beat me by a day. I started mine today, and now I’ll let the glue dry overnight. I might go with four strips instead of two after seeing yours. I was thinking of one solid piece on each side of the jig. As for the piano hinge, I rabbeted the box and the lid, so the lid sits flush. I saw the same article in Wood that you did (just haven’t made one yet…procrastinators unite…tomorrow!) Anyway, my question to you is, would you make yours wider or leave it as it is. My thoughts are that the wider the more stable and more storage. Your thoughts?